Pyramid Scheme is a 2-vs-2 minigame found in Mario Party 7. The term "pyramid scheme" refers to an illegal investment scam. Coins are released from a golden jar. The camera moves to the gameplay area and the coins fall onto the ground. 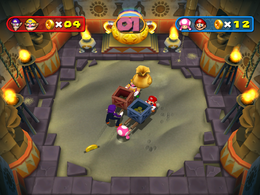 Both teams try to collect coins falling from the ceiling. Sometimes bags fall from the ceiling that are full of coins. The goal of the game is to collect many coins the pairings can soon as possible. As with all coin minigames, players get awarded the coins they have collected at the end. The only way for one to lose this game is to not collect any coins. Rules – "Work with a partner to catch the coins raining down from above!" Advice – "The coins make shadows when they are about to fall. Bags are worth 5 coins, so catch them at all costs!" This page was last edited on January 10, 2018, at 01:54.